The first thing you need to know is that there are many clinics where you can have a Dental Restoration in Tijuana. But… what’s a dental restoration? A Dental Restoration is one of the most common procedures in the odontological world. Consists of a technique that is used to reconstruct a particular dental piece in both the dental and aesthetic part. There are many ways to replace or restore missing teeth or missing parts of the tooth structure. Examples include fillings, crowns, bridges, implants, and dentures. Is a minimally invasive technique and can be done in one dentist office visit. The most common direct dental restoration is fillings for cavities. The teeth can be filled with many types of materials, like gold, silver, amalgam and composite resin, which is tooth colored. The advantage of direct restorations is as mention that they usually set quickly and can be placed in a single procedure. Since the material is required to set while in contact with the tooth, limited energy is passed to the tooth from setting process. The restoration in this technique is fabricated inside the mouth. This procedure is used when the tooth decay or damage requires more than just a filling. Typically require multiple visits to the dental office. In this technique, the restoration is fabricated outside of the mouth using dental impressions of the prepared tooth. Common indirect restorations include inlays and onlays, crowns, bridges and veneers. A crown covers the entire chewing surface of a tooth, an inlay lies within the cusps of the tooth, and an onlay covers and one or more cusp tip, including part of the chewing surface. Usually, a dental technician fabricates the restoration from records the dentist has provided. It is the making of the needed restoration that entails multiple visits to the dental office. 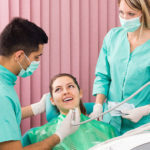 While the patient waits for their dental restoration to be made, the dentist will insert a temporary restoration in order to prevent additional damage or dental issues. Once the patient’s dental restoration arrives in the office, the dentist will cement the restoration in place using a specialized dental bonding paste. How to know if I need one? Some factors that can influence the decision to make a dental restoration can be self-confidence levels, tooth and gum health, and overall oral function. The most common reasons to get dental restoration procedures are issues like tooth decay, this is caused from consuming large amounts of foods that are high in sugar, causing acids to form on our teeth, breaking them down. The causes of teeth grinding can vary from stress, anxiety, missing teeth, crooked teeth, an abnormal bite, and sleep disorders. So with this information now you can know if you need a Dental Restoration and what kind is the more convenient for you. Look for Dental Restoration in Tijuana can be the best option because you can have quality services saving a lot of money. All In 4 Implants offer you the same materials and quality than USA and Canada, so if you are looking for Dental Restoration in Tijuana, you can take a look for us.